Just as an update to the previous post where we published letters from two of the five candidates standing in today’s election… I spoke with Cllr. Ishtiaq (the retiring Cllr, standing for re-election today) and Cllr Shokat Ali, (both Respect Party) this morning. They inform me that a response was sent out to our letter within two days of them receiving it. Their position is against Trust ownership and they both want swimming to continue on the site. If and when we receive the response we’ll post it up. Slowly, slowly we’re taking time to reflect on our Pool of Memories project in amidst the business of interviewing, cataloguing, book-writing and filming! Jen, our Volunteer Co-ordinator has written an update on our work over the past year since we received our funding on the ‘Pool of Memories’ website. This site will be the main place for news on our Heritage Lottery Funded project, as well as being an online resource where we will place a selection of the audio recordings, video, photos and written accounts we are gathering from members of the public and former members of staff at the Baths. Have a look around and don’t forget to get in touch if any of the events or people mentioned ring a bell. We are always interested in hearing from new people! Many of you will be aware that Moseley Road Baths is currently closed as work was due to begin on the lintel area around the Fire Exit on Pool 2 this month. Councillor Mullaney last week posted up a report on the latest developments which I would recommend people read to have a grasp of what is happening. The upshot is that further inspection is needed of the structure supporting the wall and the windows and that this will determine the time and cost involved. Funding is apparently available, but has not yet been signed off by the Council. Friends of Moseley Baths, whilst appreciating the scale, scope and cost of the work, are anxious to see the pool reopen as quickly as possible. The Hall Green Constituency currently has no swimming provision at all, something which is disastrous for those who rely on regular swims to maintain mobility and good health, and especially concerning for young people locally who are being denied the chance to learn basic water safety. We want to see the work completed to the standard required of a Grade II* listed building. It’s crucial that the public remain involved in monitoring what is happening. We are asking people during the closure to contact local Councillors to ask them to commit to the maintenance and reopening of the building. What do they know about the closure? Are they actively pressing to ensure that the work is moving forward? Will they approve the budget for the repairs to be done? Are they committed to the future of swimming at Moseley Road Baths? Are they prepared to make a public statement about the lack of all swimming provision in the Hall Green Constituency? Are they committed to keeping Moseley Road Baths within local authority control? Will they campaign on the issue in upcoming local elections? We would also encourage people to contact the local press and attend local Ward Committee and Constituency meetings to keep the issue in the public eye. Birmingham Mail – letters@birminghammail.net or call freephone number 0800 138 2555 or 0870 830 6985 between 8am and 5.30pm specifying that you are submitting a letter to the Birmingham Mail. We’ve had a great time on our oral history film project this week – it’s amazing how much we’ve managed to cram into just 15 hours! We’ve now got two short films, edited down from almost an hour of interviews, which we showed to all of Year 6 today. The reaction we got was great, and both pupils and teachers asked lots of questions and were interested in running the project again. It really is the case that Moseley Road Baths inspires and excites people of all ages and backgrounds. I’ll be spending some of next week producing more DVDs for all of the pupils and sifting through our footage and photos. Once that is done I’ll be putting the films up online, so keep checking back! I would like to take the opportunity to say a big thank you to Mrs Reeves from Anderton Park School for all of the hard work she has put into making the project happen, thank you to the teachers who agreed to participate, the staff in ‘The House’ who have made me feel so welcome and also to the staff from Moseley Road Baths, Jean in particular, for opening the doors to us and giving us a tour. Big thanks also to our interviewees, Mrs Evans, Miss Franklin and Mrs Reeves. And of course it wouldn’t have taken place without the hard work of the Friends of Moseley Road Baths, particularly the subgroup working on the Pool of Memories Project, or our funders, the Heritage Lottery Fund. Finally, thank you very much to the pupils who took part, it’s been good fun and I think you’ve created some wonderful work. I want to leave you with a few short films we made with the Flip which is the pupils talking about the project in their own words. The first is a rehearsal of the presentation that the pupils gave to the rest of the Year group. Enjoy and feel free to add your own thoughts on the project using the comments box below! Today the seven pupils involved in our Pool of Memories Project set to work filming people with memories of Moseley Road Baths. As soon as the session started they showed that they were completely on the ball by getting all of the camera equipment out and getting ready for the first ‘mock’ interview. Our first interviewee was Mrs Noreen Evans, who came from Northfield, ready with a stash of photos to show us to help pupils to understand a little bit more about life in Balsall Heath in the 1950s. She went to Tindal School and was a regular at the pool. She spoke about how going for a Bath wasn’t very nice as she didn’t like the carbolic soap. However, compared to her tin bath at home, or even washing in the stone sink, it was a lot better. Miss Franklin from the school came and spoke to us about taking pupils swimming, and even recalled a time when one of the members of staff accidentally covered her with water! Mrs Reeves then came in for an interview and talked about taking pupils swimming and even going swimming with her son when he was little. She talked about how much she likes the high ceilings when she swims there. Tomorrow we will be editing about 50 minutes of film footage into a short film to put on the website and to show to other pupils in Year 6. In the meantime, here is a bit of footage from the Flip camera of the pupils interviewing Mrs Evans. Why go for a bath at Moseley Road Baths? from Rachel Gillies on Vimeo. 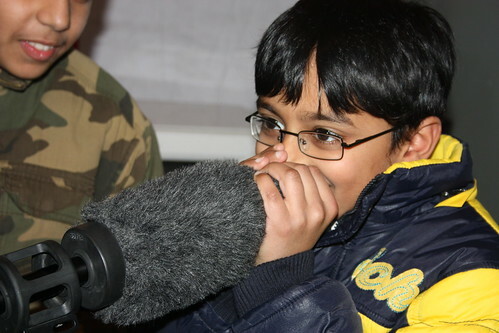 Day two of our Pool of Memories project in schools and pupils spent the day learning how to use all the film and audio equipment and had chance to film and interview each other. 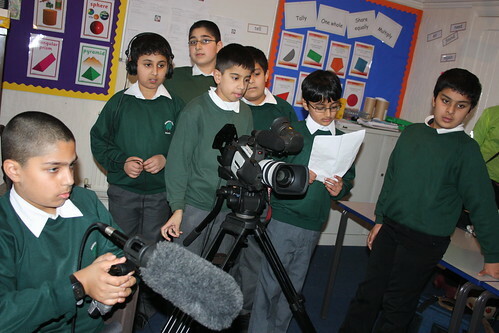 The group set up all of the camera equipment and learnt about different shots and camera angles, how to use the camera and played around with different microphones. It was a real giggle using all the microphones, especially the ‘shotgun’ microphone which was good for whispering into and pointing at different parts of the room. We then went on to talk about how we conduct interviews, how we can put our interviewees at ease and help them to tell their stories. We decided that it is best to ask open questions and to really listen to what they are saying to see if they need more time or more guidance. 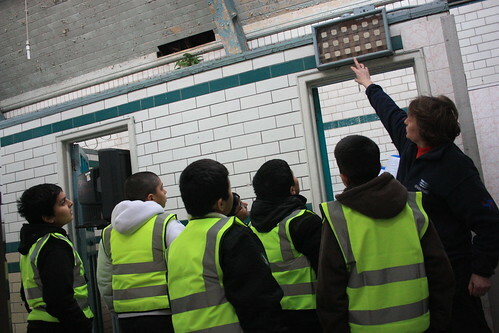 To get some practice we interviewed one of the pupils about his memories of going swimming at Moseley Road Baths. Everyone took on roles for this; one person was on camera, another did audio, one person asked the questions. Afterwards we talked about what had worked well and what we needed to change to make our interviews better. Tomorrow we will be taking all of these skills and interviewing people who have memories of going to Moseley Road Baths. Pool of Memories school work is underway! 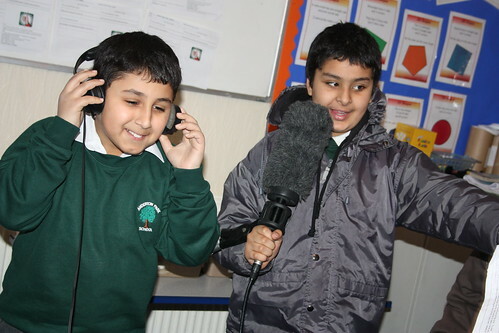 We’re absolutely thrilled that after months of planning our oral history film work in schools is underway! 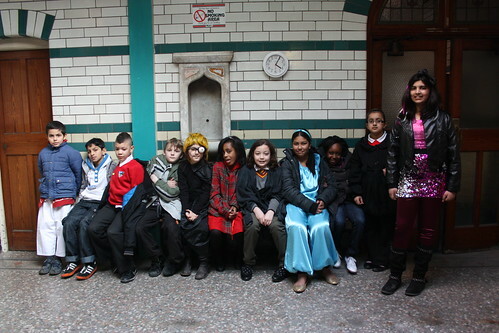 The series of nine school projects involves local film maker and member of the Friends of Moseley Road Baths, Rachel Gillies, going into local schools and helping pupils to create short films, based on their research and filmed oral history interviews with members of the public. 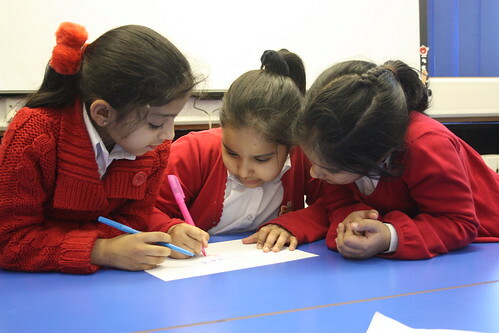 Today the first of the projects began at Anderton Park School and it will run for the rest of this week. We began the day with looking at the Virtual Tour website and then went on a walk to the Baths where we had a guided tour of the building from Deputy Manager Jean Rabone. Due to limited time in the curriculum and a marked decrease in swimming provision across the city, fewer and fewer young people are having the opportunity to undertake school swimming lessons, despite this being a component of the National Curriculum. 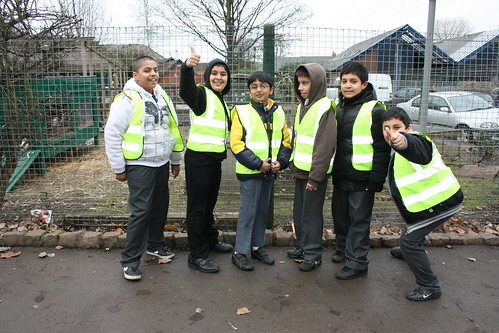 The pupils really enjoyed walking through the area as pupils from the school used to do on a regular basis. We even stopped off to see the chickens on Malvern Street as we were passing by! We spent some time outside the Baths, looking at some of the detail, the sculpture above the Women’s Entrance and the general state of the building. There was a lively debate about what ‘First Class’ and ‘Second Class’ meant above the doors! We then went in and met with Jean who took us into the Gala Pool, despite it being closed to the public since 2003. We took some time to look at the detail and learnt about some of the activities that used to take place in there. We then went into the ‘Slipper Baths’ and learnt more about people who went there for baths and what happened when they came in. A few of the group thought that paying a bit of money at the baths was probably better than paying for the bills at home! 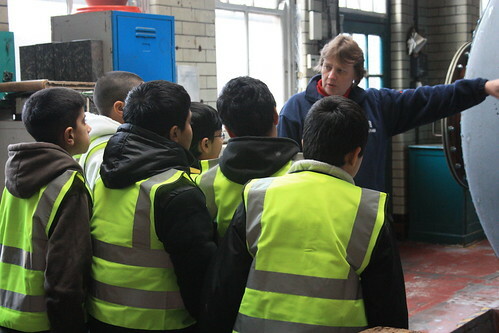 The pupils especially enjoyed going into the boiler room to see the huge boilers and filter tank. There were lots of questions about the system and how the water was filtered and heated. Tomorrow we will be looking at the Virtual Tour website and completing a quiz, before going on to learn how to use all of the film equipment. We’ll be finding out what an oral history interview is, practicing our interview techniques and then even filming each other! On Wednesday we’ll be putting all of our research, filming and interviewing skills into use by filming people from the school and the wider community talking about their memories of going to Moseley Road Baths. 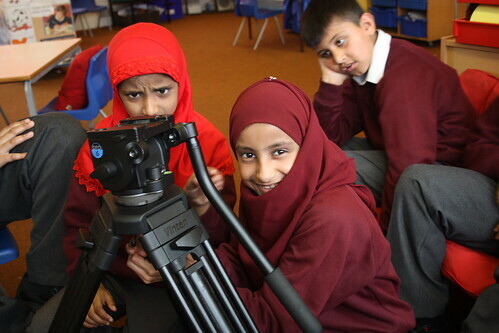 Later in the week we will edit and share our film with the rest of Year 6. Moseley Road Baths is closed until further notice due to essential maintenance work on the end of Pool 2 (the pool currently in operation). Funding has been found by Birmingham City Council to do structural work on the far wall around the Fire Exit. It is our understanding that other bits of maintenance and cleaning will be done during the closure and that the closure will last at least five weeks. Friends of Moseley Road Baths welcome the maintenance work, but are cautious about what this means for the future of the building. We will be pressing the Council for more details on the work and trying to ascertain when the building will reopen to the public for swimming. If you have further details then please share them with us via e-mail or using the comments box below. Because we like all things Birmingham and because we have such a talented group of people involved in our campaign and Pool of Memories project, I wanted to take a second to plug two smashing artists. Vivienne Harrison has been a member of the Friends of Moseley Road Baths from the word go. When she’s not keeping the Pool of Memories project on track by keeping on top of finances, recording volunteer hours and making sure that we’re on target to get everything done, she’s often found organising art exhibitions and working on her own visual arts practice. She is currently organising the ‘Women Photographers!’ visual arts exhibition as part of ‘Shout!’ – Birmingham’s Festival of Queer Culture. There is a private view on the 16th November, and then the exhibition will run from the 17th-20th November at Jubilee Trades Centre, Pershore Street, Birmingham, B5 6ND. I was really pleased this morning to see Robert Geoghegan featured as an artist on the We Are Birmingham site. Robert is a regular swimmer at Moseley Road Baths and has volunteered to record oral histories for our Pool of Memories Project. I love his cheeky take on familiar views of Birmingham. Anyone who has ever caught the 50 bus will have a giggle at his take on the bus to Druids Heath! A selection of his work will be on sale at the We Are Birmingham shop in Dale End once it opens on Saturday 13th November.